The blending of cultures in New Orleans has left a myriad of different traditions ingrained in the eccentric psyche of the city. Perhaps the most profound occur around Halloween where the Catholic, Voodoo, Irish, and French influences converge. Celebrations for the dead begin days before the fall of Halloween. 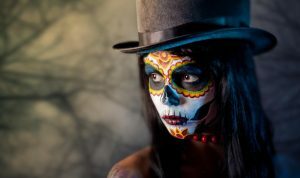 We have events such as the Day of the Dead Parade, numerous cemetery festivals, haunted houses, costume balls, and ghost tours to mark the creepiest day of the year. However, it’s the quieter and older traditions that are not as well known to outsiders. The most sacred day in the city follows the revelry associated with Halloween—All Saint’s Day or All Souls’ Day. It’s a time to pay respects to the dead by visiting family tombs located in numerous above-ground cemeteries throughout the city. It’s considered an important day where family members clean and often picnic by their tomb. Since many of the vaulted crypts are made of brick, and then plastered over, the heat and humidity of the climate require they receive regular maintenance. The tradition of cleaning family tombs is French along with the architecture associated with the mini-mausoleums. The custom of “keeping up the family vault” continues to this day in the city, and many cemeteries prepare for the onslaught of visitors the morning after Halloween, usually following a mass to bless the dead. Tokens left at the tomb include wine, wreaths of flowers, along with personal items commemorating the loved one left behind. Introduced to the city with the influx of Irish immigrants in the late 1700’s, the soul cake dates back to Medieval England and Ireland when children earned small, round cakes as they went door to door singing songs and praying for the dead. But instead of collecting candy, they would receive a soul cake for their efforts. Many believe for each cake eaten, a soul is freed from Purgatory. In New Orleans, soul cakes are part of the picnic lunch at the family tomb or consumed during the All Saint’s Day feast in memory of the dead. Many cakes sold in stores today resemble a king cake—a local carnival tradition made of cinnamon, sugar, nutmeg, and sweet dough. Another tradition is the voodoo ritual of the Dumb Supper. Recognized as a way to honor Creole ancestors, devotees participate in this Day of the Dead ritual in front of a family tomb under the direction of a priestess. The ceremony pays tribute to the powerful spirits or loas who advocate for the dead as they cross the dark waters of the Great Abyss. The Gede are the spirits who empower death and fertility, along with Mamam Brigitte— the wife of the keeper of graveyards, Baron Samedi. Offerings during the ritual include black and purple candles, sunglasses with one eye missing (to acknowledge Gede’s ability to see in both worlds – living and dead), cigars, rum, animal bones, graveyard stones and dirt, crosses, and black beads or rosaries. Devotees are often encouraged to bring photographs or other items that commemorate their deceased loved ones. What New Orleanians love most about their city are their traditions, and nowhere is that more evident than in the range of cultures coming together for Halloween. It’s one of the highlights of the year, and when you throw in the spooky ghost stories, and numerous hauntings which thrive throughout the older French Quarter, you’re sure to understand why the dead are very much alive in the Big Easy.